Liam Armstrong reports on yesterday's National Day of Action education protests. 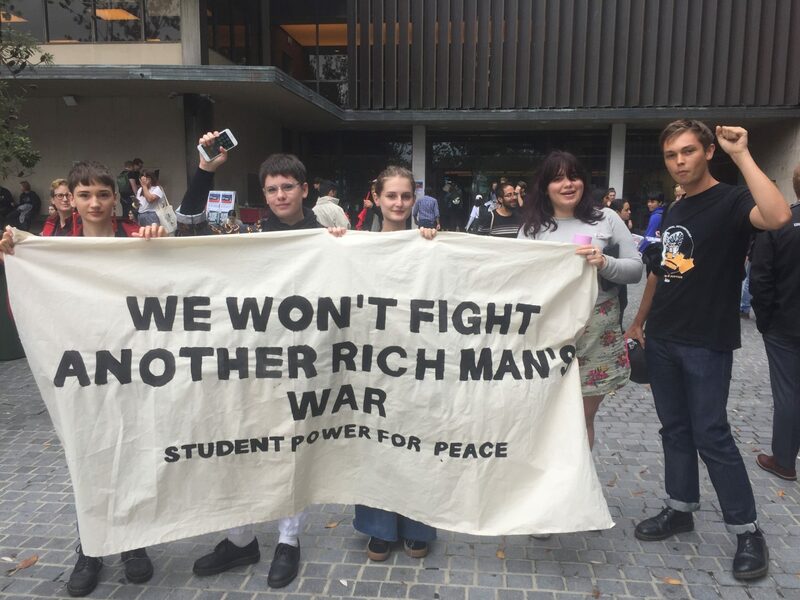 Image: protestors with signs saying 'Defend Education' and 'We won't fight another rich man's war' assemble outside Fisher library at the University of Sydney. 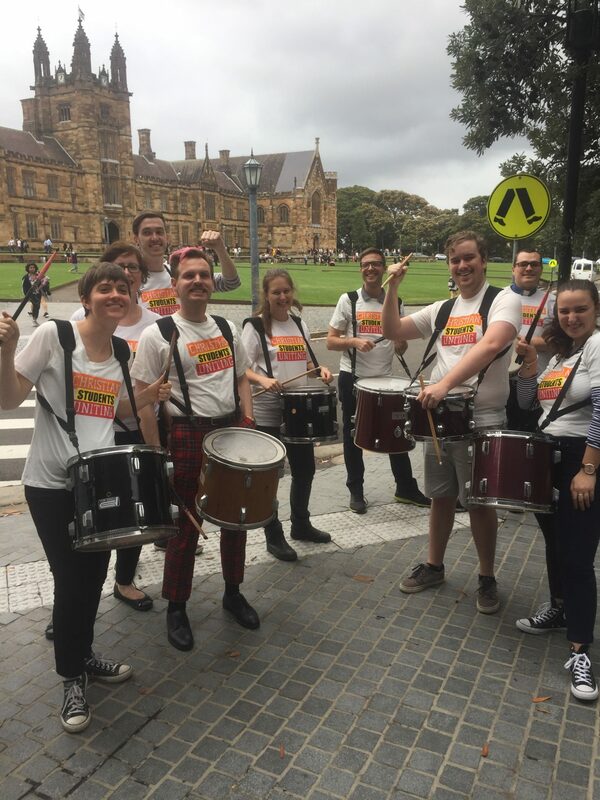 Australian university students gathered across the country yesterday to protest against the $2.2 billion worth of university funding cuts announced by the Liberal government during last December’s Mid-Year Economic and Fiscal Outlook (MYEFO). The demonstrations were part of a National Day of Action (NDA) called for and organised by the National Union of Students (NUS). The NDA demanded an end to all funding cuts, no lowering of the HECS repayment threshold and that the government ‘make education free again’. Students also demanded that universities terminate their relationship with arms companies, noting that reductions in government support increase university reliance on investments and donations in order to maintain resourcing. With this, and the Liberal government’s prioritisation of military spending and manufacturing ahead of education funding in mind, #booksnotbombs was the slogan of the protest. 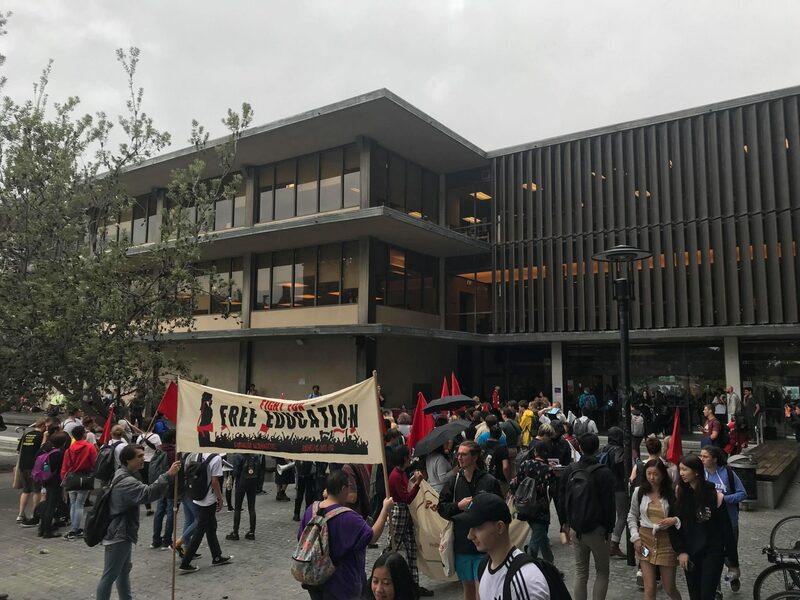 Despite light rain, NSW saw a large delegation of students, trade unionists and staff from all major universities gather outside Fisher Library at the University of Sydney. The acknowledgement to country noted many of the assembled students had also attended recent protests outside the Sunrise studios after the morning show aired a segment in favour of Indigenous child removals. The Presidents of NUS, University of Sydney Students’ Representative Council (SRC) and NSW National Tertiary Education Union (NTEU) all spoke. Greens NSW MLC David Shoebridge and Christian Students Uniting also addressed the crowd. “Dear brothers and sisters who are campaigning against the Australian government’s decision to continue and support military training with the genocidal Burmese military, we’d like to mention our gratitude to you for your solidarity on behalf of citizens of Burma who value freedom, justice, peace, and equality. Students concluded the action with a march to the office of Vice-Chancellor Michael Spence. Mark Pace, President of NUS, spoke to Honi about the significance of the nationally coordinated demonstrations. “Across the country we’ve seen students protest cuts to higher education and war spending. Students don’t just care about what we pay for our education—we care about the future of the society we inhabit. Today students raised their voices for a society where knowledge and critical thinking outweigh bombs and tanks.” he said. 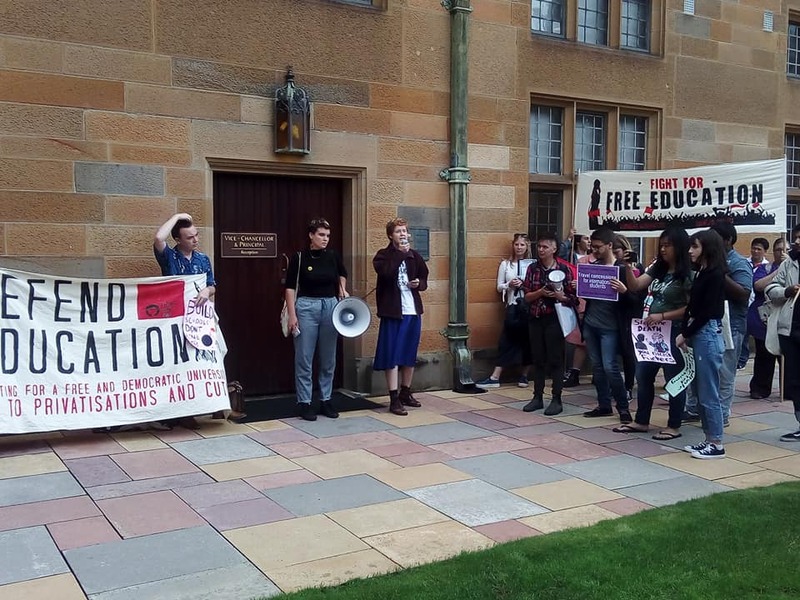 SRC Education Officer Lily Campbell told Honi she was pleased with the demonstration. “An excellent protest at Sydney University today to protest the Liberal government. Students from across the city came together to raise our voice – we want the government to abandon the proposed $2.2 billion cut to higher education and we are outraged by the escalating militaristic agenda in this country. We sent Turnbull a very clear message: we demand books, not bombs. It’s important that we keep up the fight for education. Students won’t stop until we have a free, high-quality tertiary system open to all.” she said. With the 2018 NUS campaign to Make Education Free Again off to a strong start, increased cuts to higher education could result in a return to the mass protests seen in 2014 following the Abbott government’s fee deregulation efforts. “We’ll continue to raise our voices until students are a priority for politicians, until university funding is a priority for Australians, and until we can make education free again.” Pace declared after the protest.